ProGen Luxury Vinyl Plank Easy to Install | Floors, Flooring, Carpet and More! ProGen is a vinyl flooring product with next generation center-to-surface engineering. All designed for superior performance under the trials of everyday wear. ProGen holds up beautifully against whatever our busy lives throw at it and more! Things that would destroy a normal floor – water, temperature change and sunlight, resisting buckling, denting, and warping are no longer a problem. Radically better performance is what ProGen promises with an improved experience – from design to installation to appearance to long-term wear, offering flooring for the current generation of smart, savvy consumers that looks and performs beautifully today – and that lasts for the next generation. American Carpet Wholesalers of Georgia is excited to offer ProGen in its Dalton, GA showroom and online catalog of flooring products. Safe to use in kitchens and bathrooms for a modern look throughout the home. Overcomes subfloor imperfections unlike traditional luxury vinyl tile. Resists the stresses of modern life from children to high heels to heavy furniture. Use in any room in the home. ProGen is designed to handle wide temperature fluctuations from windows and sunlight. ProGenis next generation flooring that meets the modern styles that consumers demand and the performance they expect with fantastic designs and unparalleled performance. You can use in any and every room – including rooms that experience temperature changes and rooms that are most prone to spills and moisture. There are many selling features of Tarkett ProGen flooring, but one of the most important is that it doesn’t warp or bend when exposed to temperature fluctuations or sunlight. This makes it perfect for the room that gets a lot of sun in the afternoon or any room, especially high traffic areas like hallways and mudrooms. ProGen luxury vinyl plank requires no acclimation time (most other flooring requires at least 24 hours of acclimation time). This means it can be installed the same day you receive it! ProGen luxury vinyl plank flooring from American Carpet Wholesalers can be installed with a standard tool set and easily cut with a basic utility knife! No circular, jig, or mitre saws needed. Just score the plank with the knife, bend where you score it and run the knife through the bend and it snaps off. Installing ProGen Luxury Vinyl Plank flooring is not hard, even for a first time homeowner or DIY’er. Having a few basic tools ready and watching the short installation video made the install easy for us. ProGen has three different sizes of planks. The Milled Oak Copper variety measures 7″ x 60″ and one box of 10 planks covers 28.6 square feet. Other examples are the Aurora Oak Starry Night which is a 7” wide x 48” long plank and the Stained Maple Carmine that is 5” wide x 48” long. American Carpet Wholesalers has 12 different collections of ProGen and many of these have multiple color choices in them. Great prices and great selection at ACWG! Each plank slides into the last one installed. Simply slide the new plank in along the previous plank, gently push in, then bring down and you will hear a click that locks it into place.It will be hidden once you add shoe molding to the baseboard. Do not nail it to the floor. Busy households are an area where vinyl flooring and laminate, its close relative, are particularly made for. ProGen doesn’t scratch easily. No need to worry if your toddler tracks in snow or if any furry member of the family races through the door with mud-caked paws. These floors will handle it all with no problem. Did we mention that ProGen is waterproof? Better vinyl planks and tiles have through-body coloring. Meaning if they scratch, the damage is less visible. Additionally, ProGen features a 20 mil protective layer. Small children and pets take a lot of the blame for messes and spills but clumsy adults can do some damage too. ProGen, unlike stone or ceramic tile, absorbs shocks and vinyl won’t crack or chip when a dish jumps out of the cabinet or cups leap from your hands. Vinyl is soft underfoot. As you walk, the flooring absorbs pressure. Like a sponge, it almost feels bouncy. If you’re on your feet cooking and cleaning for extended periods, you’ll appreciate the softness. Especially if you usually suffer from leg and back pain. Vinyl flooring stays room temperature. Even in winter, your floors will feel warm and cozy. No more cringing as you roll out of bed, and no more tiptoeing out of the shower. ProGen is a great choice for luxury vinyl plank flooring and American Carpet Wholesalers of Georgia is happy to feature it. ProGen is backed by Tarkett’s Lifetime Limited Residential Warranty. 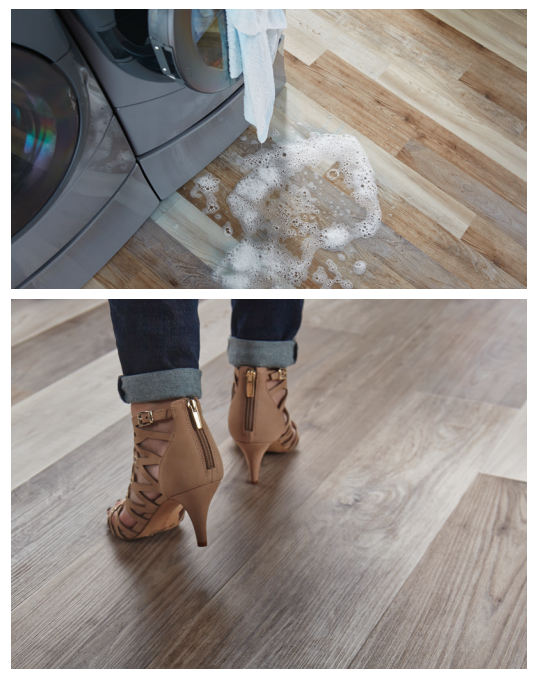 This LVT is also Floorscore certified. American Carpet Wholesalers of Georgia features Tarkett ProGen in its online gallery of flooring products. Be sure to call the ACWG flooring experts when you find the look and design you like. When you give the professional staff a call at (800)548-2706 you will benefit. How? Well, you will be sure you are getting the correct amount of flooring for your project AND you ensure your best pricing!